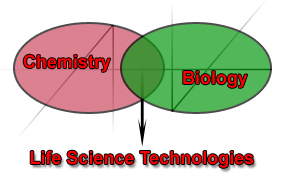 The term "life sciences" is covering areas of chemistry (such as biochemistry, organic or bioorganic chemistry), biology (molecular biology, bioinformatics), medicine and physics. The different areas often merge, overlap and rely on each other. Interdisciplinary cooperations are essential for research an work in the life sciences, what can be described with the model of a clockwork, where all cog wheels have to interlock to achieve a satisfying result. The term "click chemistry" first of all describes a reaction between two reaction partners with a short reaction time and high yields. 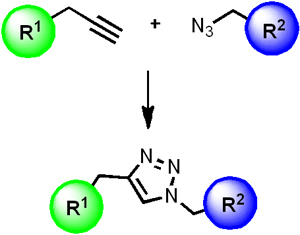 However, the reaction of an azide with an alkine to a substituted triazole is often called "click reaktion". The Cu(l) catalyzed  as well as the copper free  (where cyclooctines are used) "click reaction" is used to label simple molecules, peptides, cells and even whole organisms. These labeled compounds can be easily immobilized on surfaces like microtiter plates or glass slides or used in ligation reactions.